Tuesday is trash collection day in my neighborhood. 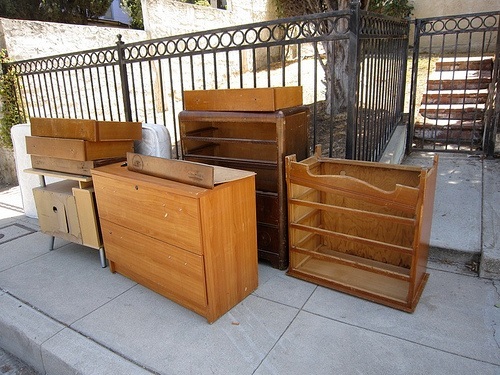 Whenever I drive past homes before the collection and recycling trucks arrive, I marvel at the furniture that is left out as rubbish. It leaves me wondering if this wood can be re-purposed? 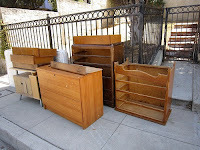 I’ve seen old wooden chairs and tables that are destined for the trash heap that could be turned into guitars. If I had the wood working talent and tools necessary to create guitars, I would be up early hauling that wood back to my house. Alas, I am only a guitar player; not a builder, however there are a few luthiers that have taken up this challenge and ran with it. In my opinion one of the most unique builders that I have heard about is 24 year old Nick Pourfard. Nick is an industrial design student and a self-taught woodworker who lives in San Francisco. 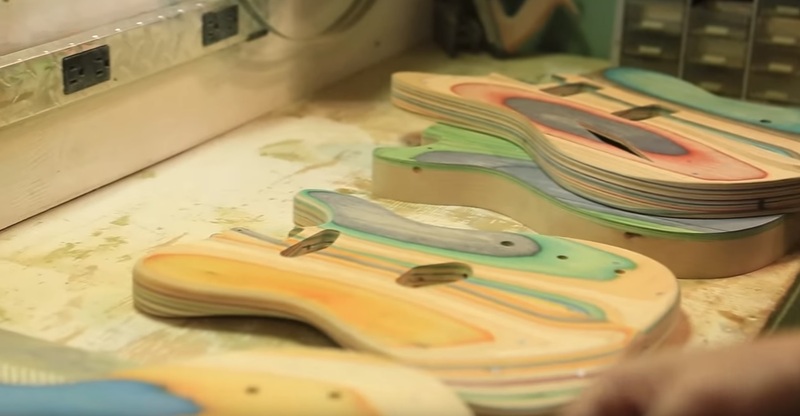 His garage and basement have been turned into a woodworking shop where he builds his unique brand that he calls Prisma Guitars. 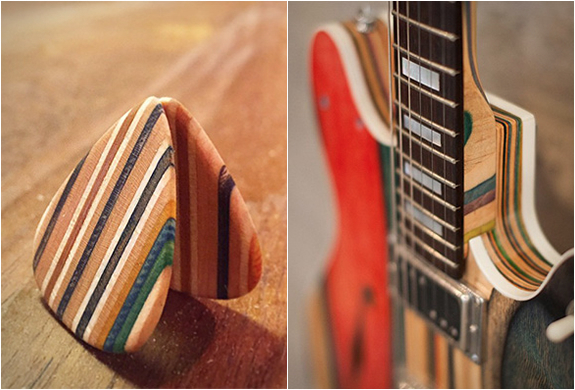 Each of these instrument are built out of broken and used skateboards. Nick was a skater and knew that skateboards are not made of plywood, but rather are made of hard-rock maple, usually with seven layers of dyed solid wood. In fact the good boards or decks are generally made of maple that has been peeled into veneers and then cured in a climate controlled environment to adjust the moisture content of the wood. Each veneer is then glued by hand with a water based wood glue. The maple veneer are then stacked according to their grain with some grains running from front to back and other running in the opposite direction. Grip tape is applied over the top of the deck. This "tape" is a sheet of paper or fabric with an adhesive on the backside and a surface similar to sandpaper on the other side. This aids the user in staying on the board, especially while doing tricks. 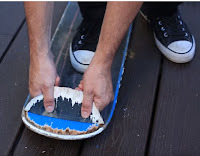 Nick removing Grip Tape from a board. When Nick find old skateboards the initial step is to remove the grip tape, either by hand or with a knife. He then shapes the boards and glues them together in a press. 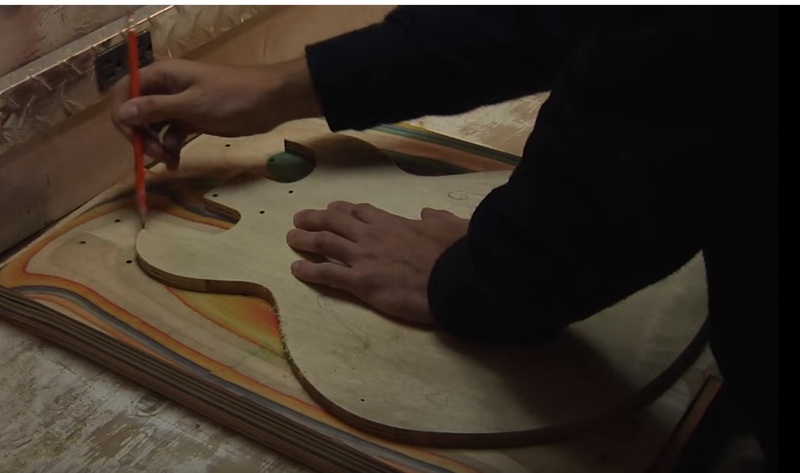 Once the wood is sanded flat he shapes the finished product by use of a template to outline the guitars body shape. This is then cut out using a band saw. Another template is applied to outline the area needed to be routed out for the neck pocket, pickups, hardware, and electronics. Necks are done in a similar fashion. The wood is glued, pressed and shaped into a basic square neck shape. Various files are used to hand shape the neck and the headstock. The results are stunning. The various colours of the diverse skateboards show through, creating a beautiful design that would be hard to capture in any other way. No painting is necessary; just a spray of clear coat. Although Nick does paint some of his guitars. One on the more unique features of Prisma guitars is the triangular, multi-colour, striped logo which is reminiscent of a pyramid point guitar pick. This is inlaid in the guitars headstock and at the guitar bodies base, where the end-pin fits. Nick has also applied his guitars features to a line of guitar pickups. There is only one other existing builder that I am aware of who uses re-purposed wood in his builds. This is Rick Kelly of New York City. 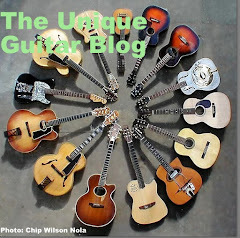 All of his guitars are made from reclaimed lumber from wood procured in the 1970’s at farm auctions. 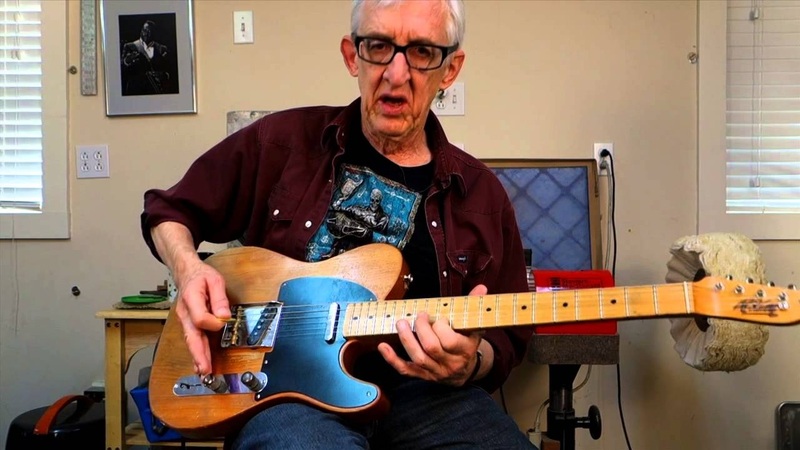 He also has a line of what he refers to as Bowery Guitars that are made from wood that was barged down the Hudson River more than 200 years ago; wood that was harvested from the forests of the Adirondacks. This was lumber used to frame buildings that were erected in the 1800’s. 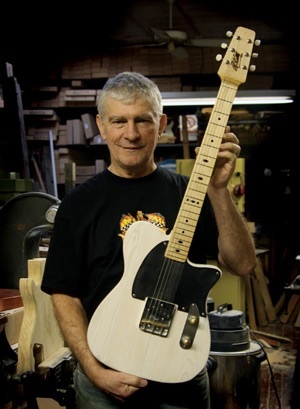 As these buildings were demolished, Rick Kelly was able to obtain some of what he refers to as “Kings Wood” to build a unique line of instruments. Most of this wood is pine. 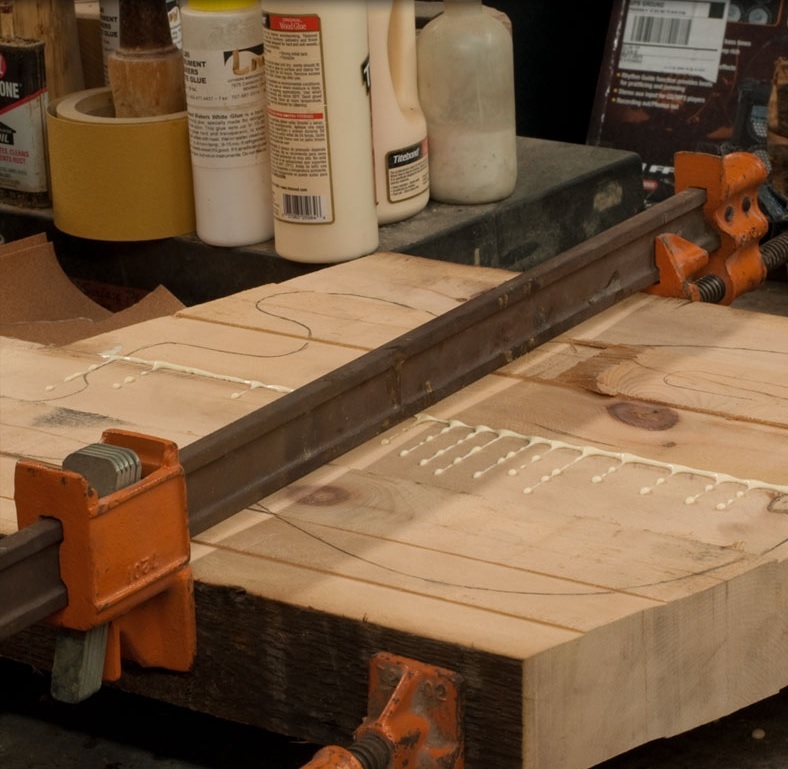 Instead of using one large billet for the body, Kelly must glue two sides of book-matched lumber together to form the body. The grain in the pine wood is quite prevalent and the result is beautiful. He even leaves the knot is the wood in the instruments body, which gives it character. Rick Kelly has some lovely creations that are favored by such players as Bill Kircher, Bill Frizzell and G.E. Smith. 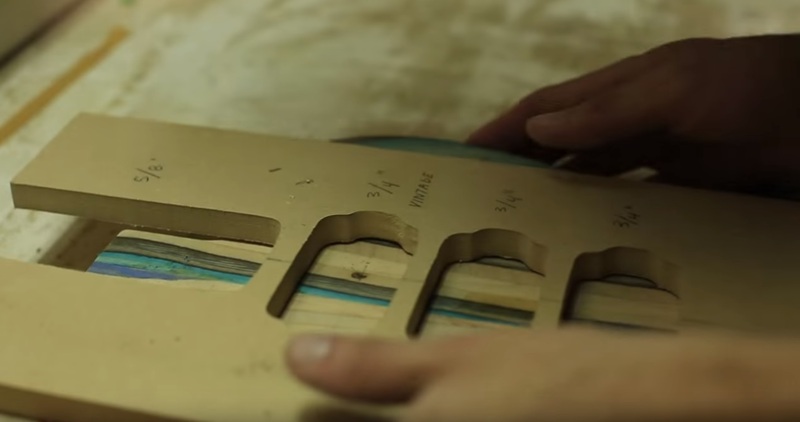 Kelly stresses that most solid guitars are made from green wood that is kiln dried, which cuts down on vibration. 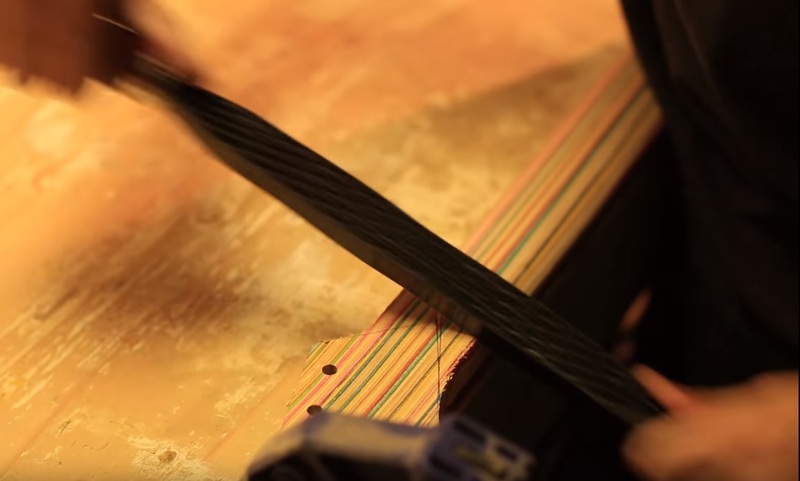 His instruments are made from air dried timber that has aged through the years. The natural resin in the wood has crystallized which leaves the pores open to vibration. Kelly makes some fantastic instruments. Most are based on Fender body shapes, however Kelly has modified them in his own unique way. 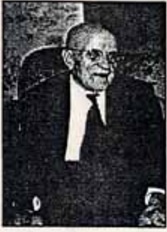 The last builders that I am aware of that utilized re-purposed lumber were Charles Stromberg and his son Elmer. Both died in 1955. During their lifetime, the Strombergs came out with a series of guitars that were built to rival Gibson’s popular Super 400 model. 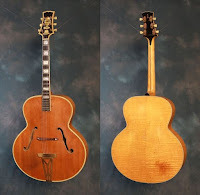 The Stromberg series Master 300 and Master 400 models built from the 1930 through the 1950’s are sought after and now command prices in the tens of thousands of dollars. Charles and Elmer had a shop in Boston Massachusetts and it is written that they frequently went to buildings that were either being demolished or being reconstructed. The men purchased lumber from these sites for use in their builds. Perhaps it is because of this old wood that their guitars are known for being louder than Gibsons or D'Angelicos of that same era. Click on the links in the pictures for the sources and the links in the the text for further information. 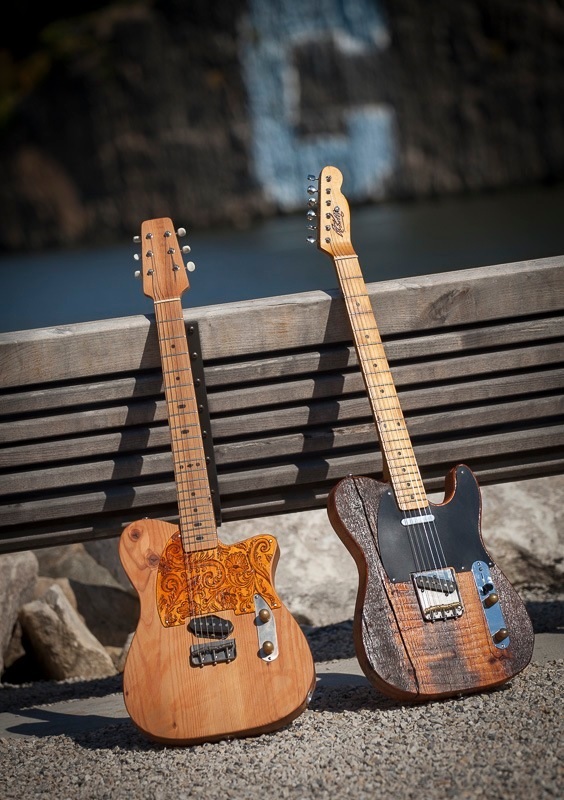 A couple of other reclaimed wood luthiers are Darkstar Guitars and Wishbass/Steve Wishnevsky. I'll have to check them out Ron. Cole Clark also made a one-off lap steel guitar for Ben Harper, inside a functional skateboard. No repurposing, just double use. Teds Woodworking has more than 16,000 woodworking sketches with STEP-BY-STEP instructions, photos and blueprints to make all projects very easy!